One of the most striking features in the auditory system of fishes is the extensive structural diversity in the inner ear and its peripheral accessories. In this chapter we will summarize this diversity in the ear, from the gross structure to the ultrastructure of the sensory epithelia, and suggest some of the possible functional meanings for these structural differences. 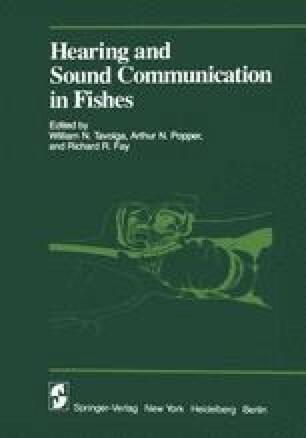 We hope that this discussion will stimulate interest in pursuing direct experimentation on the function of the fish ear in order to fill in the gaps in our understanding of peripheral auditory mechanisms. Two major points will be stressed throughout this chapter. First, we feel that dividing up of auditory and vestibular functions between the different otolithic organs of the ear may not be as absolute as has been often implied, so it may be necessary to reconsider some of the basic “classical” assumptions of auditory organ functions, at least with regard to the teleost ear. Second, we suggest that the notion of a functionally or structurally “typical teleost ear” is no longer tenable, since the breadth of interspecific structural variation in teleost ears may imply significant functional variation.